Okay, so you’ve written your story, short or doorstop-length, and you no longer like the title you started out with, or maybe you never had one in the first place. What do you do? Tom Cruise had a movie out called ‘Edge of Tomorrow’. No-one could remember the title. It doesn’t mean anything, it’s too generic, so in the UK the home entertainment release became ‘Live Die Repeat’, which is more explanatory. I think it’s best to start with one title and keep it throughout a book’s production, because the title should reflect the theme and this will act as your guide, keeping you on target. 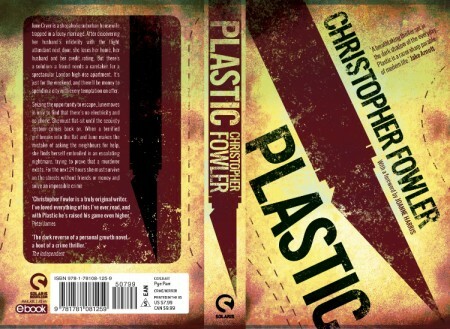 All of the Bryant & Mays have the titles they began with, but my novel ‘Plastic’ was first called ‘Shopping At Gunpoint’ and then ‘Wed & Buried’. Although I’m very proud of it, the book did not do as well as I’d hoped, so I’m rather superstitious about changing titles now. If a title is too simple readers will have trouble Googling it. A mate of mine directed a very good film he called ‘WAS’ except that the middle letter was a Greek delta that I can’t even add in WordPress. When even journalists can’t type your title, you know you have a problem. Don’t called your book ‘Love’ or ‘Cry’ because no-one will find it in searches. The more unique the title, the better chance you have of listing high. If you’re stuck one good trick is to check all the track listings of your music to jump start an idea. Another is to highlight pleasing phrases in books. For years I’ve marked down words from authors as far apart as JG Farrell and Ronald Firbank, and have used them, just as I search old movies for character names. There’s a current fashion for not being too clever with titles, and using them to explain contents clearly. Perhaps Magnus Mills’ ‘The Restraint of Beasts’ would now be called ‘Two Men Not Working’. My upcoming non-fiction work, ‘Invisible Ink’ will now be called ‘The Book of Forgotten Authors’, which is certainly clearer if less poetic. I worry about my thriller, though, which is called ‘Somebody Else’ and is a title that only makes sense after it’s read. Personally I prefer oblique titles. 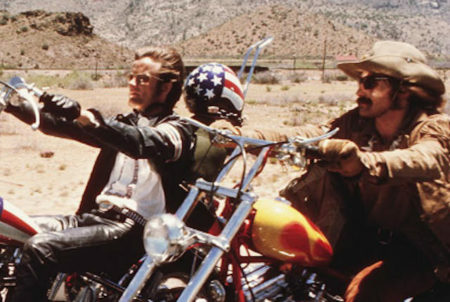 ‘Easy Rider’ says so much more than ‘Looking For America’, which was suggested at one point. Great post Mr F. I have noticed that particular ebooks found on Kindle all have common titles and its hard to pick out the one your looking for if you cannot remember the authors name. As you say simple seems to be fashionable at the moment. “The Silent Land” and “Into The Silent Land” seem to get used a lot. I wonder why some authors seem unbothered if a good title has been used before. Surprised to see that “Lady Don’t Fall Backwards” is now listed on Amazon as an e-book. You’d think Twentieth Century Fox would know better, but they released an okay animated film a couple of years ago, just called “Epic”. I’m pretty sure it would’ve done better if it’d been called almost anything else. I thought Plastic worked well as it covered all aspects. I quite like phrases for titles like Malice Aforethought, which work on two levels. Robert Goddard does this a lot: Dying to Tell, Or Sight Unseen. Is that the “Lady don’t fall backwards” that was used as the title of the autobiography of the widow of Tony Hancock or John le Mesurier? So long since I read it that I simply cannot remember which husband was first. Good read though! Ps.- still on the lookout for that title book written by Darcy Sarto. – Anybody?.? When titling something the old fashioned way of having your cake and eating it was to use a, possibly cryptic, title and then a more explanatory sub-title. It seemed almost ubiquitous in the late eighteenth century and nineteenth century but fell by the wayside somewhere in the early 20th. The most modern usage of any common familiarity I can think of was for “Doctor Strangelove”. I think that it sometimes leads to rather intriguing and attractive titles. Some people feel that a sub-title indicates a serious if not necessarily scholarly book. I like sub titles, probably from the days of Dr. Strangelove. Jo, the title ‘Lady Don’t Fall Backwards’ was originally the title of the book for which Hancock was looking in ‘The Missing Page’, by…Darcy Sarto.